How much is Microsoft earning from its Android taxes again? Analysis We’ve known for years that Microsoft makes more money from Google’s Android than Google does itself – but now we have a better idea of how much hidden “tax” is included in the price of an Android handset. That’s because Samsung and Microsoft have fallen out, and Redmond’s lawsuit sheds light on the secretive world of patent licensing agreements. To sum up, Samsung and Microsoft signed a seven year IP cross-licensing deal in September 2011, giving Samsung the rights to use Microsoft's intellectual property in its Android smartphones. We now know Microsoft’s Android licensing program covers 25 companies and HTC was the first to agree. Others named by Microsoft include Acer, giant contract manufacturers Hon Hai (aka Foxconn), Compal and slab-maker Wistron. The deals cover Chromebooks, too. Also understood to have signed similar deals are Sony and LG. One remaining holdout, Motorola, retaliated by trying to stop sales of Microsoft’s Xbox console. But how much longer it holds out is open to question – it is in the process of being acquired by Lenovo. So Microsoft says it gets royalties from 70 per cent of Android devices sold. Samsung’s agreement was based on device sales volumes. Microsoft points to a clause stating that the licensing agreement is automatically extended to any acquisition by either side. But after Microsoft announced that it was acquiring Nokia’s mobile devices unit, Samsung claimed the deal breached the agreement, according to the court filings. The Korean chaebol then paid its October instalment late, and without interest, it is alleged. Microsoft is suing over the $6.9m in missing interest. It’s a tiny amount but it appears to be the first step in a bid to reduce the royalties paid to Microsoft. But how much are these, exactly? 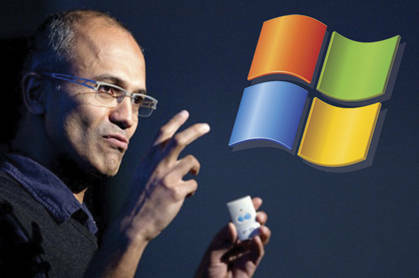 Nadella: "Our strategy couldn't be clearer: CLOUDOBILE"
In September 2013, Microsoft invoiced Samsung for a very precise $1,041,642,161.25 – just over $1bn. Gartner estimates Samsung shipped 299,794,900 Android smartphones in 2013, with 83,317,200 shipped in Q4. Knocking off Q4 2013 and adding Q3 2012 (necessary because the accounting period runs between Q3 in one year and Q3 in the next) gives us just shy of 281 million phones. What about tablets? Using Gartner figures again, Samsung shipped in 37.4 million in 2013 and 8.53 million in 2012. This includes Windows-based slates, convertibles and other devices (including this Windows 8 Samsung fondleslab). Yet Windows tablets had a negligible impact in 2013; Canalys estimates they made up about two per cent of the market. Let’s say Samsung shifted 35m Android tablets in the accounting period, along with the 281m Android phones. So an all-things-equal per-device royalty looks like it’s $3.29, or less than one per cent of a smartphone's average selling price (estimated to be $372 in 2013 by Gartner). In which case you may wonder what the fuss is about.